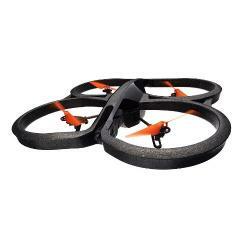 Take off with the new AR.Drone 2.0 Power Edition from Parrot! This quadricopter is controlled intuitively using a Smartphone or a tablet. The ultimate flying experience! View the Earth from above, in high definition, and share your experience on the Internet with people all around the World. Benefit from 36 minutes flying time thanks to the 2 HD batteries included and customize your AR.Drone 2.0 Power Edition with hundreds of color combinations by using the 3 additional colored propellers (red, turquoise, orange). Trying your most daring tricks won't even challenge this cutting edge design which is made to last. Fly high. Fly fast. Far away from the ground. Control the AR.Drone 2.0 with your Smartphone (iPhone®, iPod® Touch, Android™ 2.2 and above) or tablet (iPad™ or Android™) for an intuitive piloting experience. Your movements command the direction of the AR.Drone 2.0. Download AR.FreeFlight 2.0 control application for free on the App Store or the Google Play. Tilt your Smartphone or tablet to pilot the AR.Drone 2.0. Includes several control modes from beginner to expert including the new patented "Absolute Control" mode. Be a flying ace in 5 minutes! Record and share videos on YouTube and pictures on Picasa directly from the piloting interface. Access the exclusive acrobatic flip move, letting you perform barrel rolls as you are flying! Store and share your flight data (time, speed, altitude …) to unlock community achievements*. Geolocate your flights and connect with a community of pilots to discover the best flying spots and videos from all over the world or check who is flying in your neighborhood.